The official Spanish House Price Index from the Department of Housing fell by 10pc in 2012, as illustrated by the chart above. In real terms, after adjusting for inflation, Spanish house prices fell 12.9pc last year, and have fallen by double digits for the last three quarters. 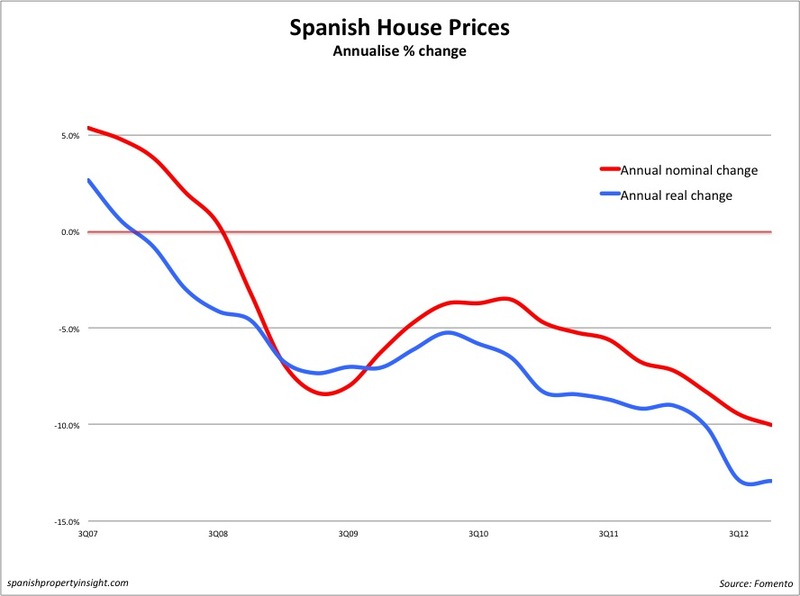 Average national Spanish house prices are now 27pc below the peak in nominal terms, and almost exactly the same as they were in real terms 10 years ago, when the property boom was just getting going. 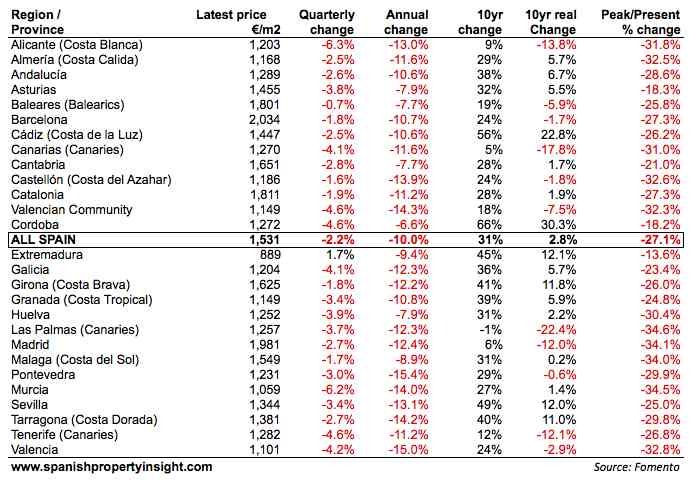 So even by the Government’s notoriously optimistic figures, it looks like Spanish property prices have been purged of their boomtime excesses. House prices fell by 10pc or more last year in most of the regions popular with foreign holiday-home buyers. This table summarises house price changes for a selection of popular regions over various time frames. Falling house prices are one reason why so many Spaniards say they have no plans to buy a home this year. Expectations of lower house prices are making Spaniards wait and see. Prices on the Costa del Sol may have fallen to’just’ E1549 psm from peak but one has to bear in mind that at the end of 2000 prices were only E841 psm. In other words prices are still double what they were 13 years ago, and so they may still have a fair way to fall.